Though few realised it at the time, 1996 was a transitional year for electronic music. After nearly a decade of sample-based ROMplers, keyboardists were beginning to pine for the good ol' days of simple analogue waveforms and interactive, knobbed front panels - a fact evidenced by the success of companies like Korg, E-mu, and Clavia, whose instruments at the time recalled the sound and behaviour of classic analogue synths. It was into this nostalgic scene that Kawai re-emerged with a brand new synthesiser, one that owed very little to any history but their own. Initially represented by the K5000W, Kawai's new sound generation engine was built on complex additive synthesis, first explored a decade earlier in their excellent K5 synth. Subtractive synthesisers shape sounds by using modulated filters to carve frequencies out of complex waveforms; additive techniques take the opposite approach, building up complex waveforms from dozens - even hundreds - of simple sine waves. Filters are unnecessary, as timbral changes are created by shaping the volume, frequency, and phase of each sine wave over time. This is a naturalistic approach, as it's precisely how real world sounds are made. The K5000 series offered a full complement of up to 128 individual harmonics (in lower and upper groups of 64) per oscillator, each with four-stage loopable harmonic envelopes. Think about that for a second: that's 512 envelope parameters - at the oscillator level. Serious programming power! Throw in a 128-band formant filter with its own envelope, add LFO, morphing and effects, and it becomes obvious that this is a seriously deep synthesiser. Additive synthesis has never been immediate, but Kawai designed the K5000 to make it as easy to program as could be. Rather than editing the level of each harmonic individually (which was possible), you could adjust, say, only the odd or even harmonics, set them all to maximum, add octaves and instantly generate a sawtooth wave. Furthermore, simple resynthesis of audio files was possible via software editors, and a selection of PCM waves was included to easily provide timbres that might be difficult or tedious to create using additive techniques. Despite the innovative system Kawai had created, the K5000W was rather misjudged at the time. This may well have been down to its being marketed as a workstation, with its General MIDI bank of bread-and-butter patches and a rather excellent sequencer. It came in for a bit of derision as a result, despite the fact that the additive synthesis engine was identical to that on the better-received GM-free K5000s (pictured). Admittedly, the K5000's keen bank of 20 front-panel knobs was in keeping with the trend toward real-time control. A rack version was issued as well, alongside an optional knob box also suitable for use with the K5000W. Today, the K5000 is recognised for its capability to generate unique sounds. Lush, evolving, complex timbres are this instrument's stock in trade. There really hasn't been anything quite like it since - a powerful and interesting creature indeed! Cube (VST/AU) offers 512 partials per voice, both harmonic and inharmonic spectra, three 64-segment envelope generators, morphable filter banks, arbitrary noise spectra and a pair of LFOs. Resynthesis of audio files is possible as well, and effects are on hand in the form of chorus, phaser, flanger, distortion, echo and reverb. Long before it was included in Logic, Alchemy started life as an additive resynthesiser from Camel Audio called Cameleon 5000. 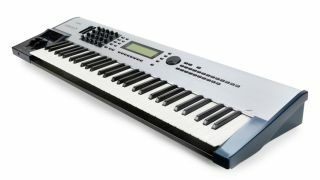 Inspired at least in part by Kawai's synth (the clue's in the name), it quickly grew and expanded into something much more complex, with a vast sound library of interesting sounds, earning a dedicated user base in the process. An often overlooked additive powerhouse, Morphine (VST/AU) offers four oscillators with 128 harmonics per voice, additive resynthesis of audio files, amplitude, detuning and panning for all harmonics, four filters, an ADSR master envelope, plus loads of effects and the ability to morph between sounds. A collection of 340 factory sounds gives you a head start.